Kutchi Dabeli, also known as Double Roti is famous street food in Gujarat, just like Vada Pav in Maharashtra. Originating in the Kutch region of Gujarat (India), Dabeli is a snack food. Kutchi Dabeli, also known as Double Roti is made from Pav (burger bun) filled with boiled potato mixture, Dabeli Masala and Chutney. In the Gujarati Language “Dabeli” means “pressed”. Kutchi Dabeli is not only famous in Kutch and Gujarat but also in Maharashtra, Andhra Pradesh and other regions. 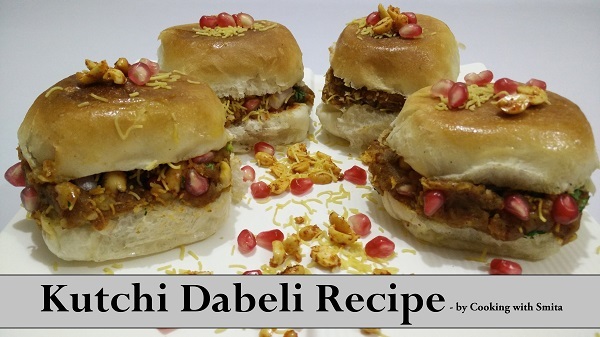 Learn how to make this super tasty Kutchi Dabeli at home and share the recipe with your friends & family. Heat Oil in a pan over low flame. When oil is slightly warm, add Dabeli Masala & Tamarind Chutney. Stir and sauté for 2 minutes on low flame. Add boiled mashed Potato and mix well. Add 2 – 3 tbsp. water and mix well. Add some more Tamarind chutney and Sugar (optional). Switch off the gas and spread the Bhaji (potato mixture) on a plate. On the Potato mixture, sprinkle some fresh grated Coconut, chopped Coriander, chopped Onion, Pomegranate seeds, masala Peanuts and Sev. Cut the Pav/Bun from the centre without breaking into apart for filling bhaji. Apply Tamarind chutney & Red Garlic chutney on both inner sides of Pav. Add bhaji (filling mixture) as required. Add some chopped Onion, Masala Peanuts, Pomegranate seeds and Sev. Close the Pav and press gently. Kutchi Dabeli is ready to serve, but Dabeli, when toasted in butter, tastes better. Spread some Butter on a pan and heat over medium flame. Place Dabelis on Tawa and toast for 2 – 3 minutes on both the sides. Kutchi Dabeli / Double Roti is ready to eat.